eBay’s announcements are the most important place to find out what’s going on (directly from headquarters) on the website. It’s a good idea to pop in and check it out from time to time. 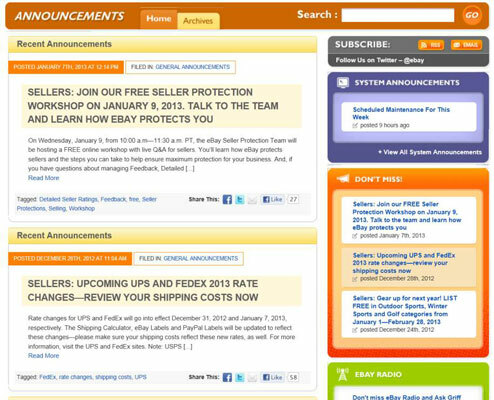 The announcements page is where eBay lists new features and policy changes. Visiting this page is like reading your morning eBay newspaper, because eBay adds comments to this page almost every day. You find out about upcoming changes in categories, new promotions, and eBay goings-on. Reach this page by clicking the Announcements link under Community on the eBay top-of-page navigation bar. eBay uses this board also to update users on glitches in the system and when those may be rectified (should you wonder whether the problem is lurking on your computer or on the eBay system). Whenever eBay introduces new features, explanations, or links, they appear on the Announcements page. Get there by clicking Announcements on the Community drop-down menu in eBay’s top navigation bar.